The Town Council welcomed the Flood Forum to the Full Council meeting last night held in Southwell Library. Many residents turned up and it was great to see so many people attend to hear about the important and essential work that the Flood Forum are doing to encourage volunteer Flood Wardens, to hear about the Emergency Planning procedures and the Flood Resilience Scheme along with the Road Closure procedures in the event of an emergency. There was a short update on the Natural Flood Management scheme taking place in the upper end of the Potwell area given by a post graduate student from Nottingham Trent University. 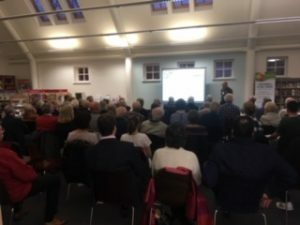 A FRAMES update was given and an invitation to attend a Community event hosted by the National Flood Forum to hear more about the ‘Improving Flood Resilience in Southwell’ project and Natural Flood Management. This event is being held at Southwell Library on Wednesday 3rd April 7pm-8pm. To finish off an update was given on the current mitigation scheme that is being delivered by Nottinghamshire County Council. There followed many questions relating to current progress and queries as to why specific work was not being carried out in areas of the town and these questions were all answered with information available. There was a huge emphasis on new developments and the requirement for Community Infrastructure Levy funds to be made available for increased flood mitigation work. The Council thanks all residents and volunteers that attended the meeting and hopes that the information and questions that were answered has helped keep the town informed of progress made so far. Please keep an eye out on our Facebook Page and Website for further dates of Drop In Sessions and updates.